A few minutes into my chat with Chris Eubank Jr it suddenly occurs to me just how much he sounds like his dad - only slightly less refined. Which is odd when you consider that Eubank Sr grew up hard on the streets of London and New York while the latest version attended a notable English public school. This Eubank family tale is a lesson in the magnetism that can exist between a father and a son, so that however divergent the two lives might become, a commonality of genes and attitude will see to it that they converge in the middle. Eubank Sr had an impoverished youth, finding himself ejected from various London schools before winding up in care. At the age of 16 his dad packed him off to live with his mum in New York's South Bronx, where he weaned himself off the wildness, knuckling down in the gym and finding salvation in boxing. Eubank Jr grew up in the genteel south coast town of Hove and was educated at Brighton College. A man who wears jodhpurs and a monocle is hardly likely to send his kids to the local comprehensive, but a man who wears jodhpurs and a monocle is hardly likely to make life straightforward for those kids, either. "I was dealing with the troubles that come with having the second name of Eubank," says Eubank Jr, who has his seventh professional fight on Saturday against an opponent yet to be announced. "Other kids wanted to test me, I had to defend myself and I got into certain situations I'm not proud of. I was a street kid as well as going to private school." And so Eubank Sr took a cue from his old man, sending the unsettled kid across the Atlantic to immerse himself in the gyms of Las Vegas. Among his tutors were middleweight great Mike McCallum and Floyd Mayweather Sr, the latter a rare example of a top-level fighter whose son was more talented than he was. 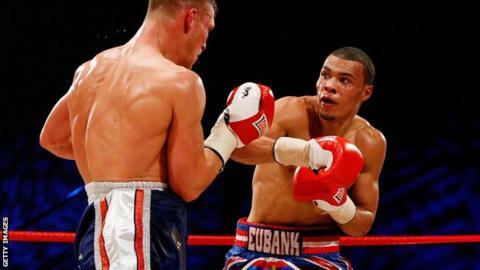 "In the early stages my dad wasn't sure about me boxing," says Eubank Jr, whose record is 6-0. "So that was my dad saying: 'You say you want to be a boxer, then go and experience what it truly is to be a boxer.' Vegas is the capital of boxing, it's the melting pot for great fighters, so if you can survive out there, then you'll know whether you really want to be a professional fighter or not." Eubank Jr didn't just survive, he thrived, reaching the prestigious National Golden Gloves tournament. McCallum even predicted he would be a future world champion, adding: "He's nothing like his dad, he's extremely nice and polite." However, Eubank Jr insists his dad is very different from the caricature he portrays and glows when I suggest he has gone from being one of the most hated sportsmen in Britain to someone held in genuine affection. "He deserves it," says Eubank Jr, whose speech might be less refined than his dad's but which is noticeably more fluent. "He's a great guy, a family man, completely different to the arrogant person people saw in the ring. For all the work he put in, the entertainment he provided and everything he achieved, he didn't deserve to be hated. It's great that people love him now." While this filial bond is heart-warming, there are those in boxing who worry about the pressure Eubank Jr is under to succeed. Noting the identical entrance music (Tina Turner's Simply The Best), the vaulting over the ropes and several stylistic tics, Nigel Benn said: "If he jumps into the ring like his dad and has the same music as his dad, then he better perform like his dad." Eubank Jr, who even shares the same pro trainer as his dad in Ronnie Davies, is relaxed about the comparisons. "He's my mentor, he's the guy controlling everything, making sure I've got the right people around me, inputting into my training," says Eubank Jr. "I trust him 100%. If he tells me something, I'm going to do it. "But there's no pressure at all. The ring entrance, that's all entertainment. I'm here to bring excitement back to British boxing and that's the best way to do it. Obviously a lot of things he used to do have rubbed off on me but everything I do is natural, I'm not copying anybody. "People say I'm doing things just because my old man did it but that's genuinely how I fight: I'm his son, I've got his DNA, I've got royal blood running through my veins." Eubank Jr's early fights suggest he is looser limbed than his dad and perhaps more skilful, but - and this is the big but - only when the kid is tested will we know if his heart is anything like as unbreakable as the old fella's. "I know from the hard sparring sessions I've had that I have a big heart, I'm not looking for a way out," says Eubank Jr, whose dad was involved in some of the most gut-wrenching fights in history, including two thrillers against Benn and one against Michael Watson that left Watson with life-threatening injuries. "I'm not looking to prove I have a great chin and a big heart - my motto is 'hit and don't get hit' - but if it does happen, I'm sticking with it, you'll see." Most men yearn to live on through others and the yearning grows more acute as the years roll by and they feel more irrelevant in the world. To this end, Eubank Sr will hope he has created a masterpiece, or at least a chip off the old block. "There are people that don't like me, who say I'm living off my dad's name," says Eubank Jr. "But the greatest thing I can learn from him is to believe in myself. He was hated, people said he wasn't going to make it and wanted him to lose. But he knew he was going to make it and get these people on his side." Keep those eyes and ears open, young man, but maybe draw the line at fashion tips. "That would certainly get people going, if I started wearing a monocle," says Eubank Jr. "Maybe I'll try it out and see what happens."